Hello, friends! It's Wednesday and that means we have a brand new awesome challenge on the Simon Says Stamp Wednesday Challenge Blog! Our challenge this week is Have a Heart; we want to see you incorporating hearts into your designs in one way or another. The Design Team is featuring Reverse Confetti products this week. You don't have to use them to join in, but if you've got some, we'd love to see what you do with them! If you are new to Reverse Confetti, you are in for a treat! They have some seriously adorable stamp designs available in the Simon Says Stamp Store! 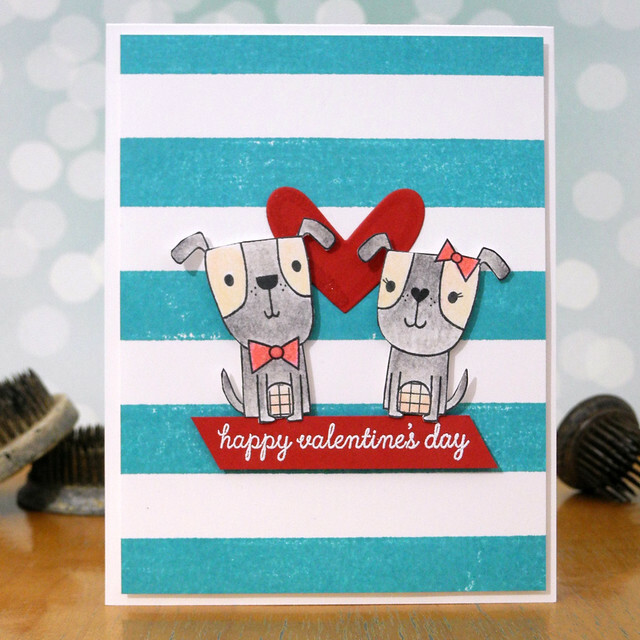 I used the super cute Puppy Love stamp set for my card. These pups are ADORABLE!!! 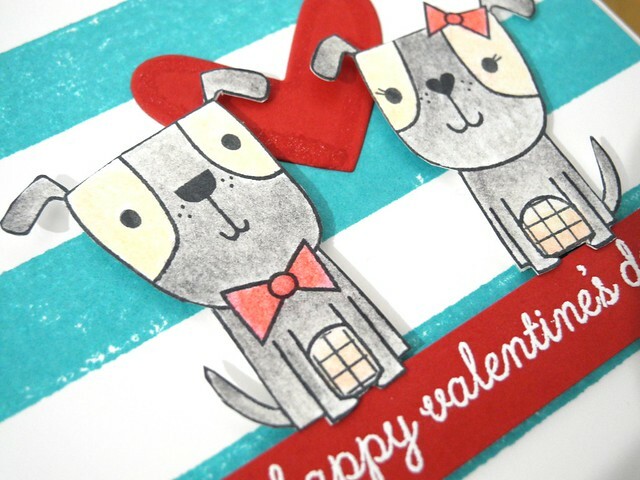 I combined it with a couple of Simon Says Stamp favorites, the Wide Stripe Background and a wonderful heart die. I pulled out my Spectrum Noir colored pencils to color the images. It's been a long time since I last used them and I felt it was due time! I actually quite enjoyed playing with colored pencils again! I love this teal and red color combination. I've been a bit obsessed with it lately, actually. It just makes me happy. Now it's YOUR turn! Create something fabulous based on the Have a Heart theme and link it up to the Simon Says Stamp Wednesday Challenge blog for your chance to win a $50 Gift Voucher to the Simon Says Stamp Store! WOOT! All links in this post are affiliate links. Your support is very much appreciated! Thank you! These pups are very popular this week, but everyone has managed to make them look different! Great colors and I love that added heart between them! An adorable card Jennifer, a lovely design with super colour combo........your pups are so sweet and a fabulous heart and sentiment!! This is so very cute! I love the striped background with this! This is such a cute card! Those adorable puppies look great on that striped background!